I have worked around, and photographed the Elwha River on Washington's Olympic Peninsula for the past 18 years. Recently I have been documenting the 3 year process of removing the Elwha and Glines Canyon Dams, and the restoration of the river. I have been giving slide show presentations on the Elwha around the Northwest and am available for bookings for your group, school, or organization. Please email or call me for more information. From a recent press release: The slide show and talk offers a broad overview of the ecological, cultural, and political issues surrounding the largest project of its kind to date in the U.S. “An amazing collage of circumstances, spanning four presidential administrations and 18 Congressional appropriations bills, came together to allow this landmark event to happen,” Kessler says. “And the restoration is playing out on multiple levels,” he adds. Re-establishing the salmon runs and renewing the flow of nutrients to streams and forests will benefit the Elwha ecosystem. Redressing the treaty obligations between the state and federal governments and about 40 tribes around Puget Sound will benefit the Lower Elwha S’Klallam people. And rectifying Washington State’s decades-long neglect of fish passage regulations and environmental protection on the Elwha will restore the trust of citizens. “Each of these threads has a fascinating story, but the big picture—the magnitude of what’s happening on the river and all the levels on which wrongs are being corrected—is even more powerful,” he says. Moreover, the Elwha represents a template for other dam river removals and restoration efforts around the country. "Thanks for a fabulous presentation tonight! We were so proud to host this event, and the audience loved your photography and your insights. Wow-- standing room only in Port Townsend is really special, and your presentation was outstanding!" WF, Jefferson Land Trust Natural History Society. First Scoops of Cement Coming Out. 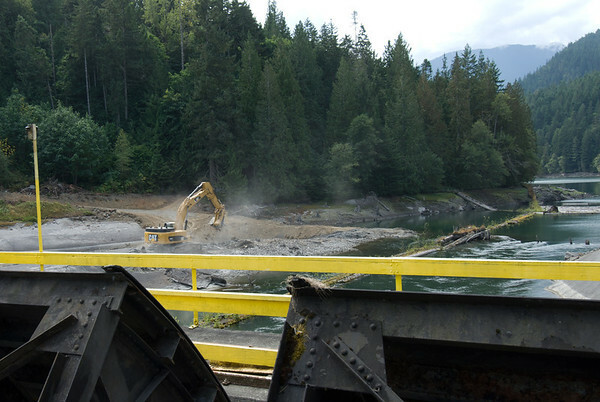 September 17, 2011 Dam Deconstruction Day, Elwha Dam, Washington.